Mark Walker at the drums in a rare Chicago performance featuring: Victor Garcia - trumpet; John Wojciechowski - tenor sax; Jim Trompeter - keyboard; Eric Hochberg - bass; Joe Rendon – percussion. 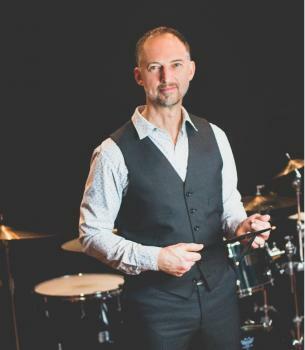 Mark Walker, a multiple Grammy winning drummer, composer and educator, began his career in Chicago in the late 1980’s. His first teacher was the “Dean of Percussion,” Roy C. Knapp who had taught Gene Krupa and Louis Bellson, among others. After gaining experience in a wide variety of settings, he became a first-call jingle session drummer/percussionist and began touring regularly with the Lyle Mays Quartet and Paquito D’Rivera’s Havana/New York Ensemble (featuring Giovanni Hidalgo and Danilo Perez) in the early 1990’s. He moved to New York in 1995 and immediately started touring with the Caribbean Jazz Project (featuring D’Rivera, Dave Samuels and Andy Narell). He soon got the gig with Michel Camilo, playing in his trio and recording projects produced by Camilo. In 1996, he began his long stint with seminal world-fusion group Oregon, featuring Ralph Towner. During this time, he also worked extensively with Eliane Elias, Linda Eder, the WDR Big Band, the NDR Big Band and Cesar Camargo Mariano, as well as local gigs with the best musicians in New York. He was also featured in Fernando Trueba’s film Calle 54 with Paquito D’Rivera. He has also performed live or recorded with Joe Henderson, Michael Brecker, Arturo Sandoval, Ivan Lins, João Bosco, Steve Khan, Randy Brecker, Wayne Krantz, Mike Stern, Will Lee, Gil Goldstein, Dianne Schuur, Oscar Castro Neves, Salif Keita, Dave Liebman, Wynton Marsalis, Jim McNeely, The Impossible Gentlemen, Sakesho, Mike Abene, Mike Mainieri, Vince Mendoza, Airto, Don Alias, Rosa Passos, Ruben Rada, Eva Allyon, Karrin Allison, Michael Philip Mossman, Guillermo Klein/Los Guachos, Bob Mintzer, Rosemary Clooney, Donna Summer, Sammy Davis Jr., Monty Alexander, Luis Conte, Alex Acuña, the Tchaikovsky Orchestra of Moscow, the Chicago Chamber Players, The National Symphony Orchestra, Claudio Roditi, Leny Andrade, Dianne Reeves, Regina Carter, Edmar Castañeda, Double Image, The Trinidad All-Stars Steel Band, Andy Narell, Eberhard Weber, Michael Manring and Bobby McFerrin.